Halloween is coming. Let's watch horror movies! 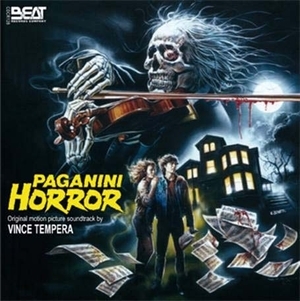 Vince Tempera's music for Paganini Horror is the 434th Soundtrack of the Week. Many of these cues are synth-generated atmospheres of tension and suspense. They're actually kind of pleasant to listen to, when you're in the right mood. There are also some more aggressive pieces, similar to some of the cues in the soundtrack for The Terminator. The movie itself is about a rock band so of course we get a couple of songs from them. "Stay the Night" is a pretty blatant rip off of "You Give Love a Bad Name" by Bon Jovi. "The Winds of Time" is probably equally derivative of something, or many things. One part of it reminded me of ABBA's "Waterloo". But I kind of like it.